Timber is fast becoming a feature in many modern homes and what better way to feature timber than on your garage door? While real timber garage doors look great initially, they do require ongoing maintenance throughout their lifetime. A timber look garage door is a great alternative to real timber and can provide your garage with the beautiful look of timber without the high costs or ongoing maintenance. 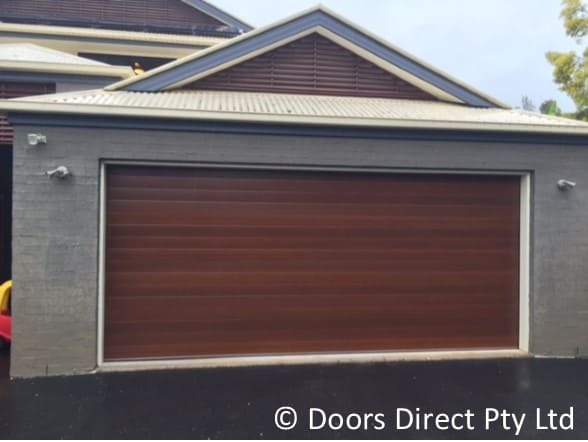 Timber look garage doors are made from durable Colorbond steel and have a timber look finish hand applied over the top. You can choose from a wide range of timber look finishes to suit the look you are after. These doors are custom made to fit your garage door or carport opening and can be motorised for your convenience. Timber look garage doors are available in the Sectional / Panel lift or Tilt garage door when a particular design is chosen. Check out our gallery of timber look garage doors we have installed to see just how great they could look as a part of your home.